How has the season been so far? Kenneth's work pile tells the tale! Harley Burbage's big buck weighed 195 lbs. Terry Treece picked up his mounts over the summer! Tiffany Mattox got this big buck on opening day! Bill Moore brought in this big fellow to be mounted. Zack & Ian Bloom brought in a 6 point. Russell Weeks got an 8 point that weighed 141 lbs. Luke was a trooper letting us take lots of pictures as he was inducted into the Cordray's First Deer Hall of Fame. Luke Elliott is 10 years old. Luke shot a 215 lb. buck tonight. The biggest problem is the deer is WAY bigger than the boy! 215 lbs. Kid's first deer! Eric Burn picked up this mount of a Kansas monster over the summer. Many of you enjoyed our free range, farm fresh eggs last year, but I often didn't have enough for everyone who wanted them. This spring and summer we've been working on fixing that problem. The project started with my birthday present. Michael designed an awesome rolling chicken coop. Next we added lots more chickens. Some came the old fashioned way. (An aside story: It was raining late one evening and the rain shut off my brooder light. I was out in the dark and rain about 11 pm trying to get it going again and fell, badly spraining my ankle. After a trip to the ER and about 3 months of physical therapy, Michael calls those my $1000 hens. :)) Some chickens we ordered from catalogs to get a good variety of brown egg laying chickens. Throughout, I've had lots of help! So if you get a chance to come by, check out the free range chicken condo in the front field and plan on picking up some of those delicious eggs! Mr. Richardson's extreme sneak buck mount! The next time you have to track a deer, call Jim's Deer Recovery Service. He'll bring out his dachshund tracking beasts and in no time you'll recover your deer and be on your way to Cordray's! Really in a time crunch? 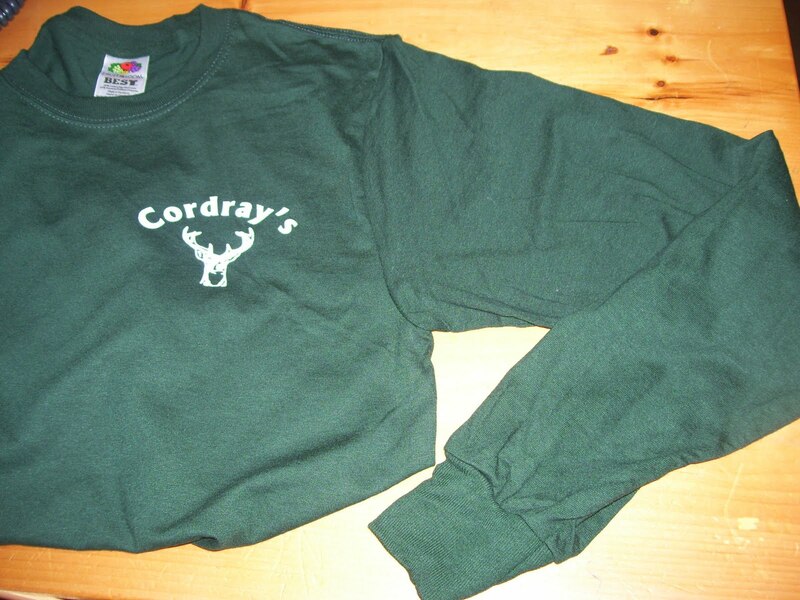 Jim will track the deer, find it, and bring it to Cordray's for you. If he finds it after our closing time, he can skin, clean, and pack it on ice for you and check it in with us in the morning. Now how's that for service? Call Jim to ask about prices. 843-425-8464. Petey Davis poses with his son's buck. Dakota's deer was a velvet 4 point. 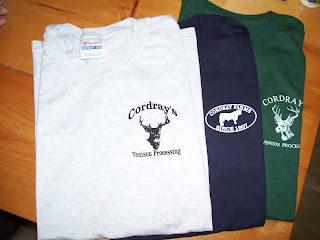 Check out the Cordray's shirts when you stop by! Pinkney Mikell brought in a velvet 6 point. Look how the antlers almost touch! Ben Sweatman's nasty looking boar hog made the Fiercist Sight of the Night! Steve Meyer's buck was a 10 point in full velvet! Jason Tidwell brought in a nice velvet buck tonight with 8 points. Jason's wife, Stephanie, helped him share the fun! Roger Sparwasser's buck had 8 points! Don Balderson's buck had 9 points with a big kicker off the right side. Clark Higginbotham's buck was an 8 point in velvet weighing 182 lbs. Brenda Hoats got a 9 point buck. He weighed 156 lbs. on the hoof! Brian Graack's buck weighed 155 lbs. and had 8 points. Joe Ballo's buck was a nice one! 8 points and 114 lbs. Michael Craig's big 9 point buck was in full velvet. Reese Allison got an 8 point that weighed 122 lbs. His was the first non-velvet deer we've seen. James Sams got 2 velvet bucks with one shot! Paul Speights got this big velvet beauty! 2012 Season is starting off in a big way!